In November 2018 I journeyed to Ushuaia to meet Adolfo & Laura Imbert, founders of an incredible ride at the end of the world. This was a short visit to the horses’ base, to ride, meet the guides and visit the area in which the expedition runs. It may have only been a short visit, but Tierra del Fuego and the Imberts made a lasting impression on me. 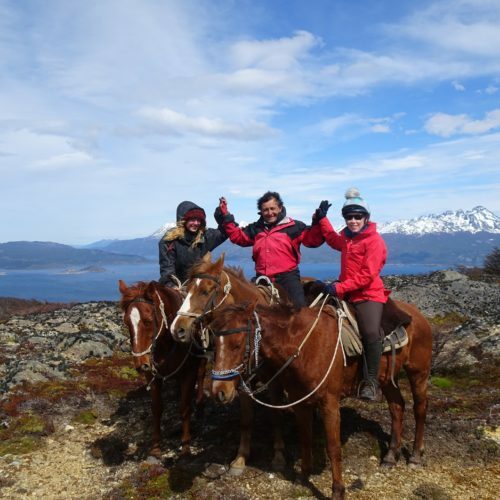 Adolfo & Laura’s ride explores the Mitre Peninsula, an uninhabited area on the easternmost tip of Tierra del Fuego. Peninsula Mitre spans 790,000 acres of pristine nature and includes peatlands, native forest, rivers and endemic flora and fauna. Because of its rich natural resources, the peninsula is under threat of exploitation. Adolfo & Laura have worked hard for many years to help preserve this special area, maintain it as one of the wildest places on the continent and they are keen to show it to you as their guest. The Mitre Peninsula expedition is an eleven night trip, with eight days of riding. This is a really remote place and you could be in the saddle for up to seven hours a day – more if things do not go as planned – so you need to be riding fit and a competent rider to undertake the challenge. If you like hotel accommodation and en-suite bathrooms then this is not going to be the trip for you! The first and last nights are spent in hostel accommodation in Ushuaia, the nights in between are basic camping. Showers and loos are only available on five out of the eleven nights. Our Mitre Peninsula expedition is a unique chance to explore the wilderness of Tierra del Fuego. The weather may be unkind at times and the accommodation may be basic, but you will follow in the footsteps of the first heroic explorers of Patagonia, experience pristine nature at its best and perhaps see species such as condors, penguins, sea lions and guanaco along the way. 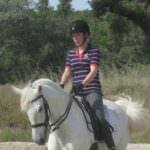 Our 12-23 November date is an Exploratory Ride accompanied by a member of the In The Saddle team. Additional dates are available between December and March. There is a direct flight from Ushuaia to Cordoba, so after the expedition why not spend a few nights at Estancia Los Potreros to ride and relax in beautiful surroundings before you head home? Please contact me on +44 1299 272 239 or email abigail@inthesaddle.com for more information.